If you are looking for CNC punched sheet metal work manufactured to your own designs then you really must give V and F Sheet Metal a try. 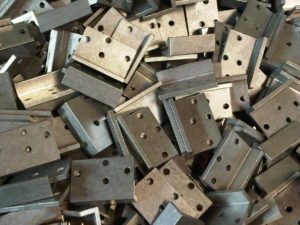 The flexibility of produce sheet metal blanks on a CNC punched press is illustrated here. Some parts have been punched out along the length of the sheet and some across the sheet. These efficient CNC punch nests have been produced automatically using Radan sheet metal software. Whenever we can we will extract as much value out of a sheet of metal, saving waste and helping to keep down your piece part prices. This is a simple sheet metal surround CNC punched on our Trumpf 200 CNC punch press. It could just as well have been CNC punched on it’s bigger brother, the Trumpf 3000 or even laser cut on our Trumpf 3030 fibre laser cutter. Having all these machines under one roof enables us to use the correct option for your sheet metal design when is comes to prototyping or volume production. Produced in a thin gauge zintec coated mild steel substrate these parts are perfect if they need to be powder coated or can even be left self colour if they are used in a dry and warm environment. 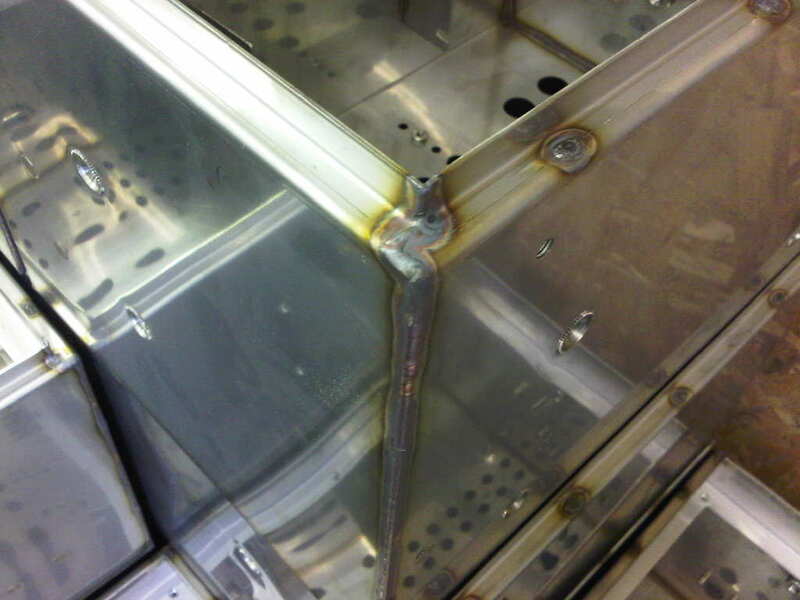 For more help on your sheet metal work designs or any manufacturing advice please give our engineering team a call on 01489 577786 or send us your drawings to sales@vandf.co.uk and we will be happy to help you. Sometimes we have to manufacture a range of parts all on the same order for our customers. 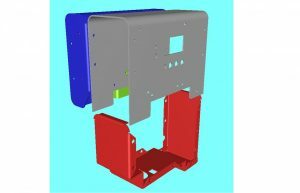 If the sheet metal work if all designed to use the same materials and thickness we can produce them as families of parts from the same sheet. The aluminium parts shown here are just such a case in point. 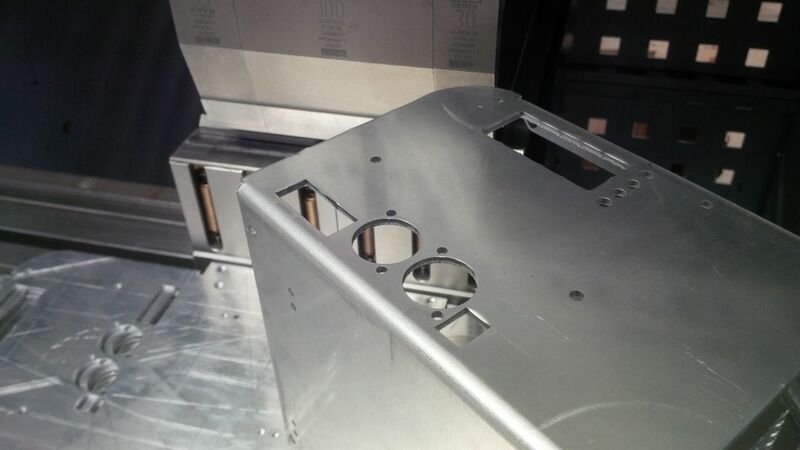 We have CNC programmed the housing bases and covers together to ensure that they can be CNC punched out together. This then allows us to fold them together and check all the holes align and the cover is a good fit on the housing base before they are sent off to be powder coated. This technique is often useful if the sheet metal parts do not fit a standard sheet very well. 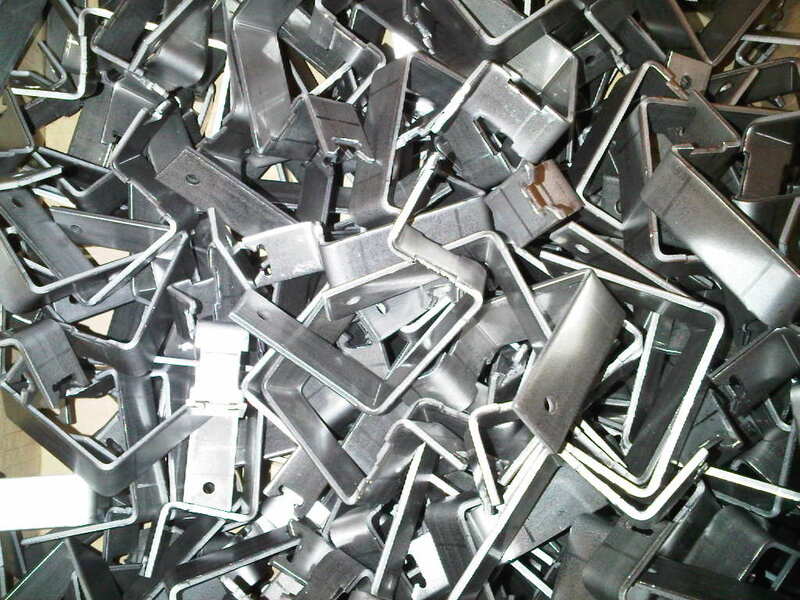 By looking at several parts to be nested together we can often eliminate waste in the sheet and then reduce the sheet metal component costs. I have managed to capture the Trumpf 3000 CNC punch press in the middle of CNC punching out the aluminium housing bases. Being sheet metal workers based in the UK we need to use manufacturing equipment that is flexible for any size of project we are asked to make for our customers. The Trumpf 3000 is a very powerful machine being able to produce samples, small batches and large production volumes with very little tooling set up times. This makes it the perfect sheet metal working machine to produce CNC punched parts for the starting point of the manufacturing process. 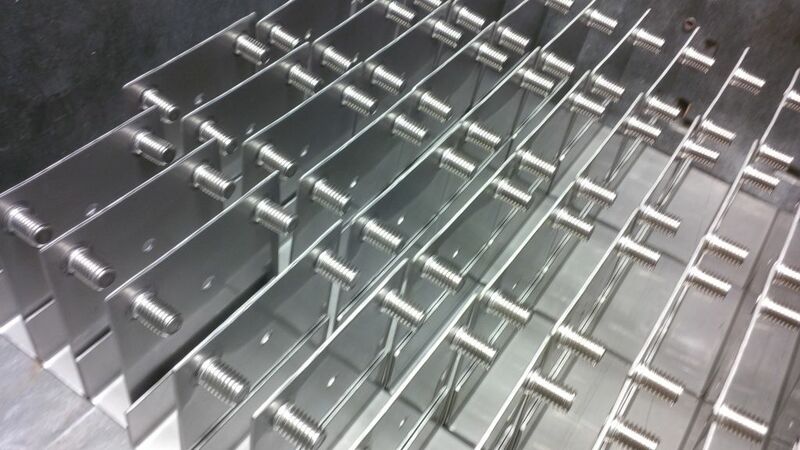 Added to the ability of the punch press to tap threads and form up bent sections the machine is the best you can get when manufacturing sheet metal work. Here’s a perfect example of the type of sheet metal work that we can produce on our CNC punch presses. Both of the examples selected here could have been CNC punched on either machine. This leads to a more flexible approach to production demand planning and security of supply for time sensitive orders. Although our Trumpf 200 CNC punch press is an older simpler machine it is still the work horse that just goes on and on. Punching out sheet metal work in a range of materials and thicknesses is easy for this machine. With a wide range of CNC punch tools and the right software we can CNC punch most sheet metal work that our customers need without any new tooling. 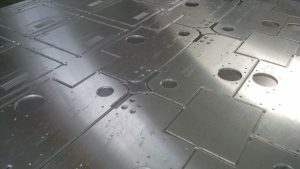 For more information on our standard CNC punch press tooling which can be used in your designs please take a look at CNC punch press tooling tables. 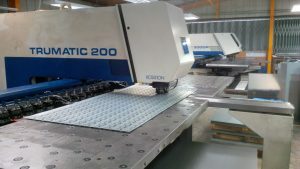 If you have a sheet metal project and it needs CNC punching let us know and we will be happy to produce a quotation for you. These components are typical sheet metal folded profiles produced on our Safan e-Brake CNC press brake. 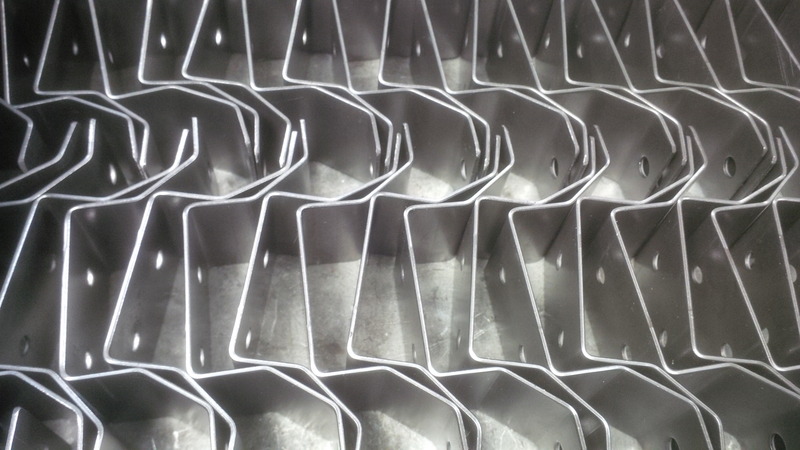 Simple folded profiles like these are produce all the time here at V and F Sheet Metal. These profiles were folded from 0.5mm aluminium alloy and will be used in the building trade. 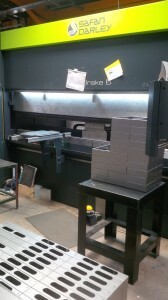 The blanks were easily cut on our guillotine and then straight to the CNC press brake for folding. 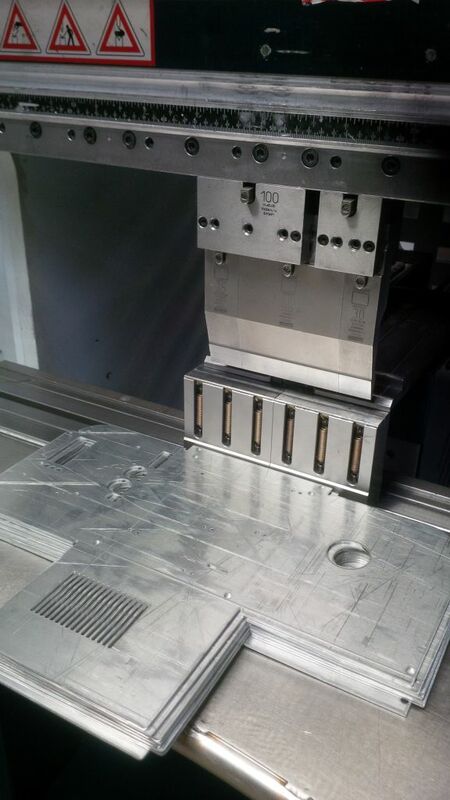 All the tooling used was from our standard tooling range which we can share with our Trumpf 7036 CNC press brakes. The use of common press brake tooling allows us to be more flexible when it comes to rush jobs and production bottlenecks. 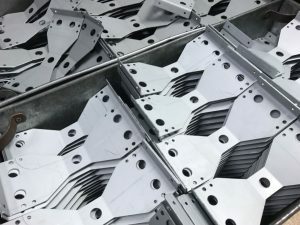 The ease with which folded profiles can be CNC programmed and then set up ready for production is a real plus with the Safan-Brake and enables us to try out pre-production parts quickly when needed. 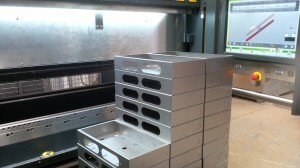 All the CNC program data is then stored on our company server ready for any repeat batches of components. 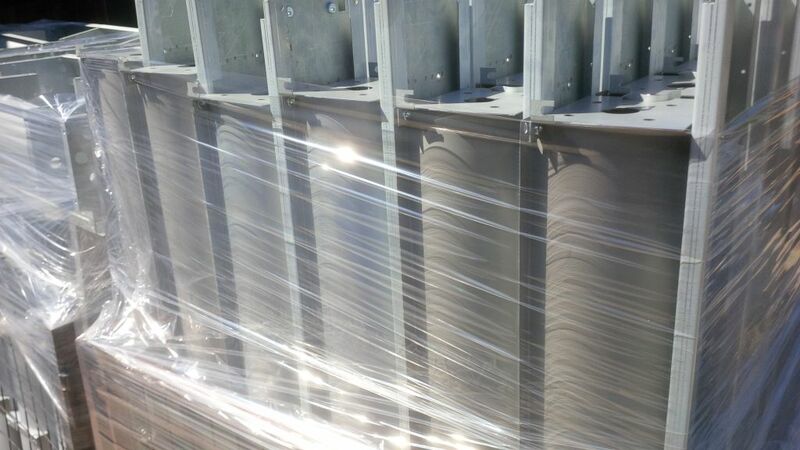 Here are the folded profiles stacked us ready for packing and shipping to our customer in Portsmouth, Hampshire, UK. Although these folded profiles were simple with just 2 bends in them much more complex sheet metal work can be folded up on this press brake and up to 3M long. With 100 tons forming capacity the press brake covers all the needs we have for folded profiles that our customers have. 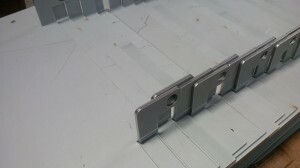 Stainless steel front panels with stainless steel stand offs. 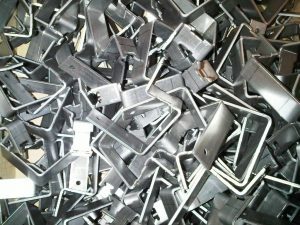 If you are looking for sheet metal components manufactured with pressed inserts you have certainly come to the right place. Based in Fareham, Hampshire, UK right by the M27 for over 30 years we have produced a wide range of sheet metal components with inserted studs, bushes and standoffs. 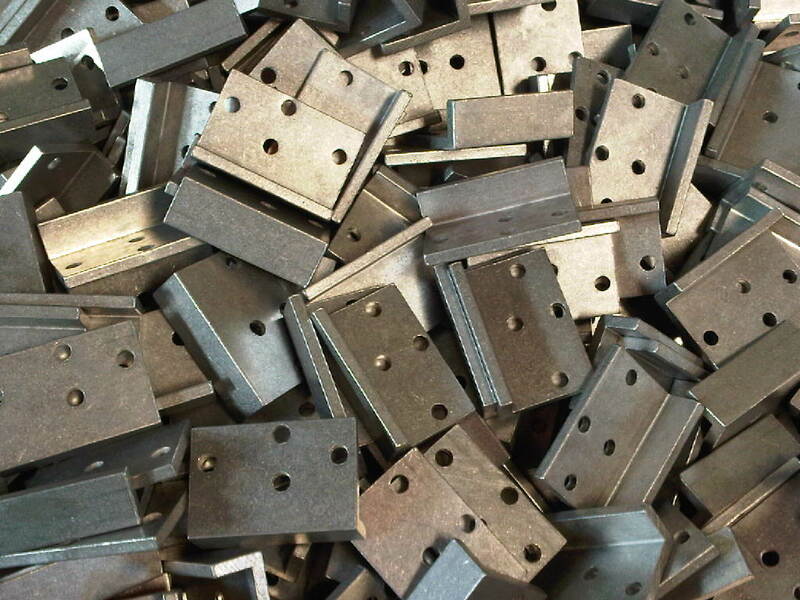 Whether it is stainless steel panels, aluminium enclosures, mild steel angle brackets or welded fabrications we have a vast experience of pressing in a wide range of inserts. The 2 sheet metal work examples shown here happen to both be manufactured from 304 stainless steel. As well as the components being in different ferrous and non-ferrous materials we can also insert stainless steel, aluminium alloy and mild steel zinc plated fixings. With the wide range of designs available to you there is always a solution that we can use to help speed up your assembly. All the sheet metal components that we manufacture here at V and F Sheet Metal have inserts pressed in either on our Haeger bush / stud inserter or various fly-presses. 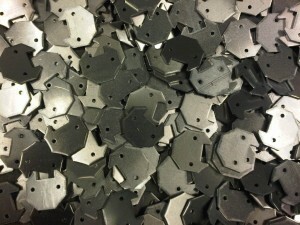 Both methods work well in pressing inserts into pre-punched or laser cut holes. The positional tolerances are to within +/-0.2mm and they are very reliable. As well as the standard self-clinch and hank style anchor rivet style bushes / studs there are many specialist parts that can be inserted. For example there are inserts allowing PCB to be snapped in place or bushes with nylon rings to prevent screws vibrating out when in operation. 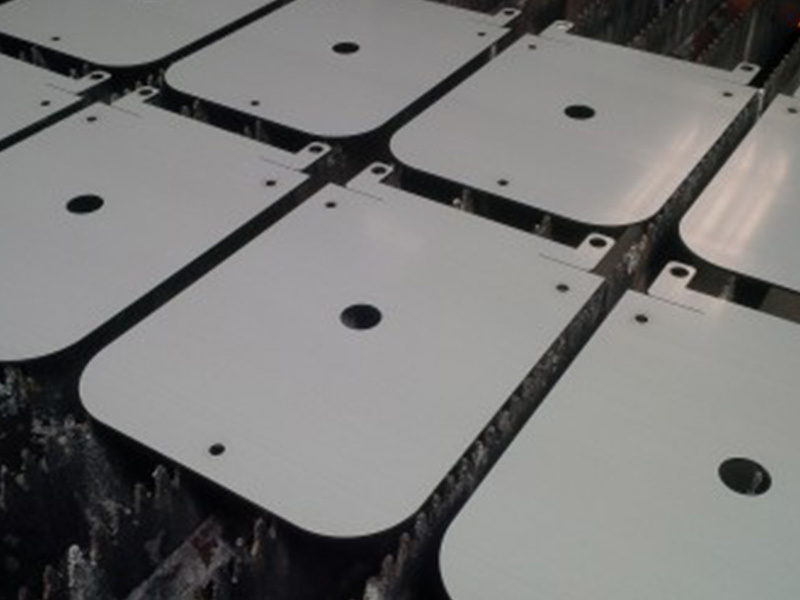 If you want more information on the types of pressed inserted that we can source and insert for you please give us a call on 01489 577786 and we will be happy to advise you on the right solution for your sheet metal component design. Here at V and F Sheet Metal we have been CNC punching sheet metal using CNC punch presses for many years. We have used them to produce all our sheet metal blanks and they are for most jobs the first operation in the manufacturing sequence. 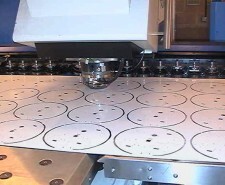 Whether the CNC punching is carried out with turret machines or single head (Trumpf) style machines the process is designed to punch holes into a single sheet of metal as quickly as possible. We use the Trumpf style CNC punch presses as we feel they are the best machine when offering a sub-contract sheet metal work service. 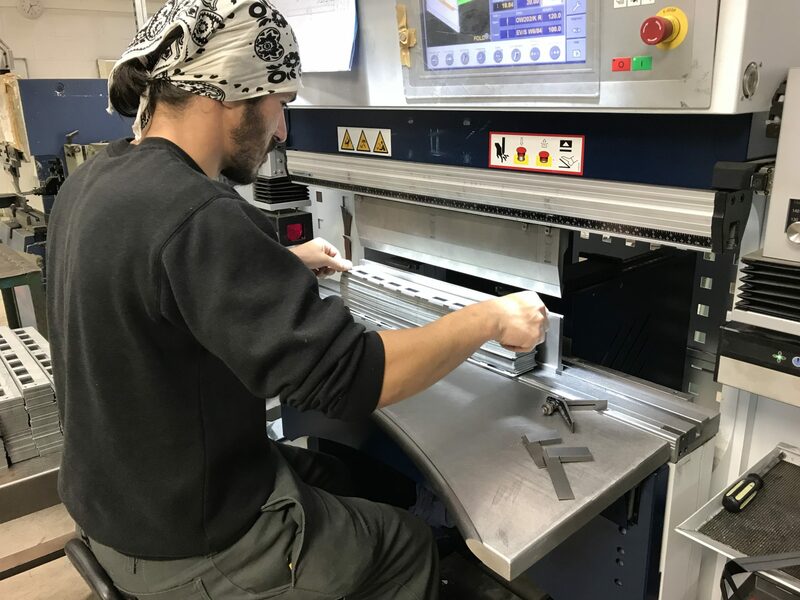 These CNC punch presses are so flexible and quick to set, helping us to keep components costs low even when only small batches on components are required. Both of our CNC punch presses are programmed with Radan sheet metal CAD/CAM software. 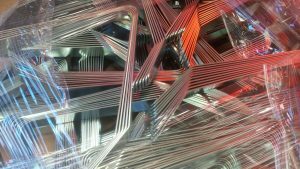 Having common programs and common tooling across both machines enables us to plan production more efficiently to smooth out the inevitable rush job that comes along. 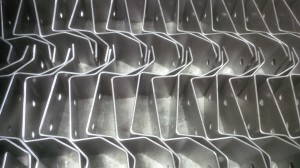 As well as being able to punch holes, slots, forms and outer profiles we can produce folded tabs in our sheet metal work. The special CNC tooling that enables us to do this is called a multi-bend tool. The tool can form up tabs up to 40mm long and 20mm high and is great on applications like these aluminium lighting gear trays. 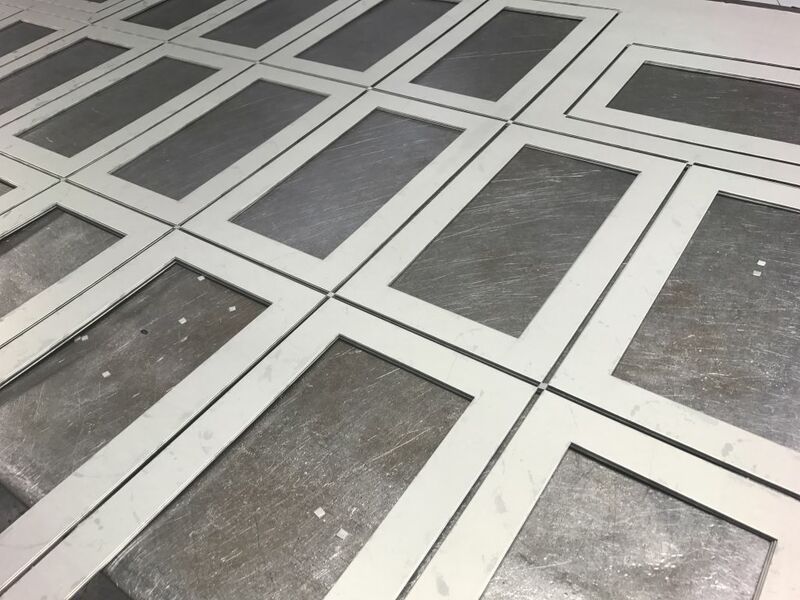 These sheet metal trays have 4 tabs folded up on the Trumpf 3000R punch press and then the remainder of the folds bent on our Safan e-Brake CNC press brake. The multi-bend tooling is very quick to use and can on the right job form up more than 2,500 bent tabs per hour. The size and angle of each bend is controlled from the Radan software and only adjusted at the machine for sheet gauge fluctuations. 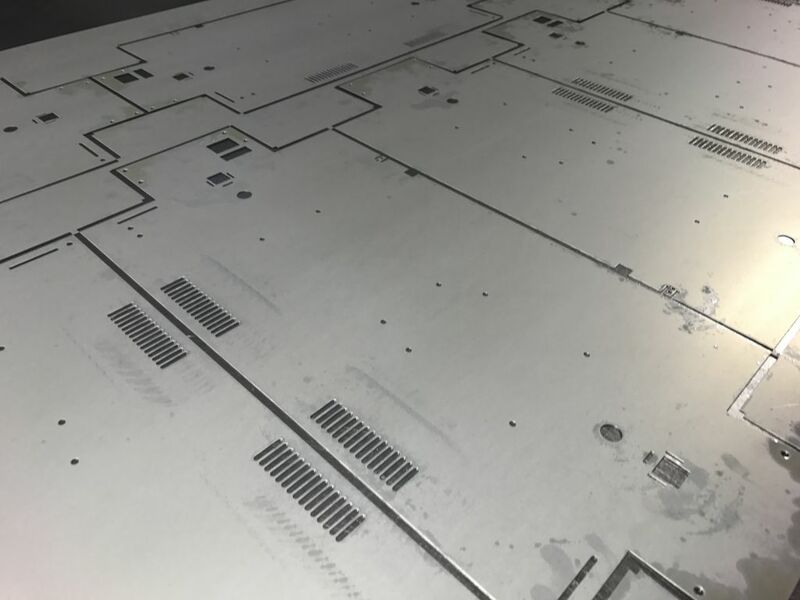 If you would like to know more about CNC punching sheet metal with this tooling option or any other features that we can use to enhance your sheet metal designs please give us a call on 01489 577786 and our engineering team will be happy to help you. 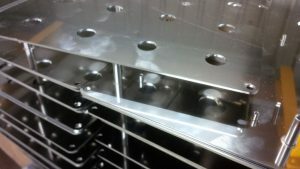 I thought it would be nice to mention a couple of sheet metal working projects that we have been involved with recently. These are a collection of aluminium parts that go to make up a set of brackets and housings for some LED display equipment. In October we manufactured just a small batch of sheet metalwork for a regular customer of ours for them to try out before they move into production quantities. All the aluminium parts have been laser cut on our Trumpf 3030 fibre laser and needed no further edge de-burring due to the clean edge produced from the laser. They were then folded up and had a series of bushes and stand-offs inserted ready for our customer to start their assembly. Here is a higher volume sheet metal work project that we manufactured in October, this batch was for 1,500 brackets. These mild steel brackets have simply been laser cut and folded here and then we had them zinc plated and colour passivated using one of our sub-contract treatment partners. Being able to call upon the resources of a number of painters, powder coaters, platers, anodisers, machinists, silk screeners etc. 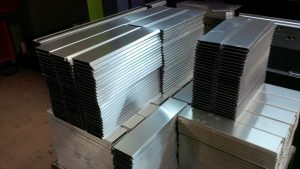 enables us to offer a more complete service for your sheet metal working needs. So if you are looking to have a sheet metal working project produced this October or in the future please give us a call. We are happy to take your current drawings and produce price options for you or help with production design ideas where you need them. Please call on 01489 577786 if you want to chat through your required. If you want to send us you files please e-mail them to sales@vandf.co.uk or fill in the contact sheet on the website. It’s not often that we manufacture components in brass but on this occasion brass sheet metal was used to produce these electrical contactor brackets. 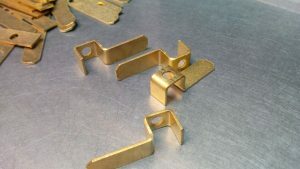 Small brackets like these can be cut out from brass sheets by either CNC punching using a range of our standard CNC punch tools or by laser cutting with our Trumpf fibre laser cutting machine. Being one of the new breed of fibre laser cutting machines it is able to laser cut brass and copper sheet materials, up to 6mm thick. These materials were previously very difficult or impossible to laser cut with CO2 laser cutting machines. As well as copper and brass our fibre laser cutting machine can laser cut mild steel, stainless steel and aluminium enabling us to offer our customers a wide ranging service in processing sheet metal blanks. In this case the small flat blank was then edge de-burred to make it smooth and safe to handle before being folded up with three 90 degree bends. Using basic CNC press brake tooling a whole range of simple and more complex bends can be performed on any material to make bespoke sheet metal work. 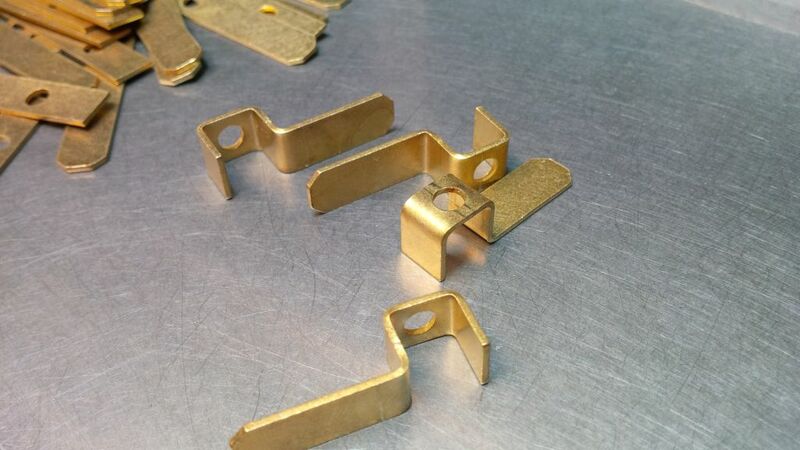 Although these small brass sheet metal brackets are simple they nicely show the ease with which sheet metal components can be formed up using bends on our Trumpf 7036 CNC press brakes. You only have to look through a few of the blog posts on this site or the sheet metal component gallery pages to realise just how flexible sheet metal manufacturing can be when you have the latest CNC manufacturing technology. 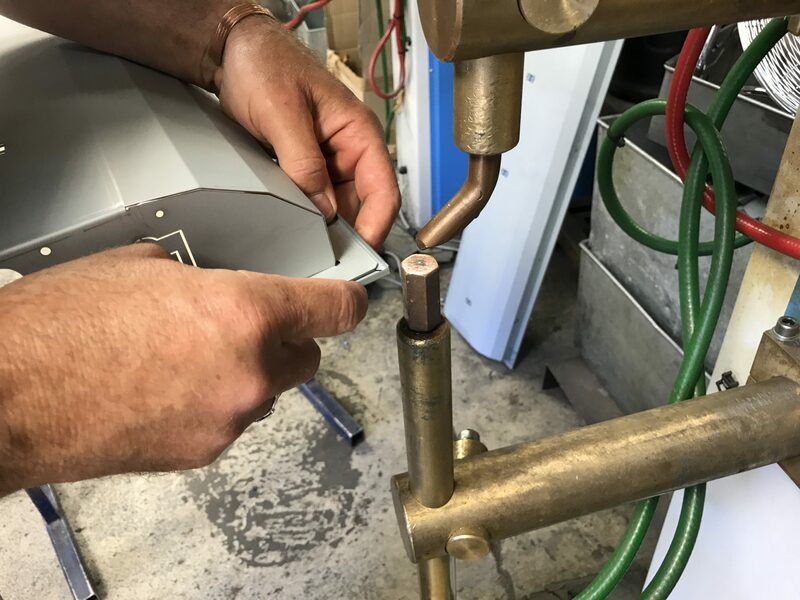 If you want to know more about how we manufactured these brass electrical contactor brackets or any other sheet metal ideas you might want to discuss please just give us a call on 01489 577786. 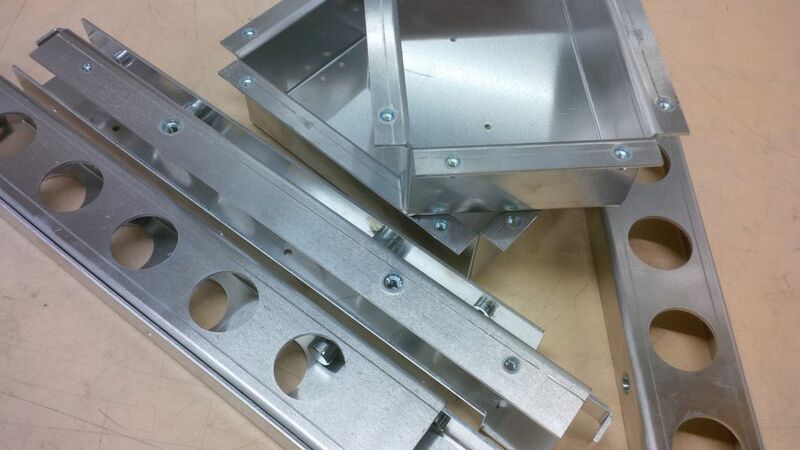 If you already have a sheet metal component design that you want us to take a look at, so much the better. Just send us your drawings to sales@vandf.co.uk and we will be happy to help you. 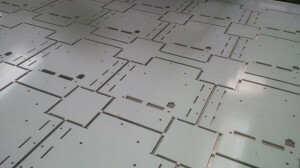 Laser cutting aluminium sheet metal work in Fareham, Hampshire. Here’s a nice little video of us laser cutting aluminium sheet metal work with our Trumpf 3030 fibre laser cutter. You can get a real feel for the speed of the laser cutting machine when cutting a thin sheet of metal and the ease with which it can process straight and curved profiles. Laser cutting aluminium sheet metal work can be carried out using either nitrogen or compressed air as the cutting assist gas. In this case we are using compressed air as the components were not too thick and the edge finish achieved was more than acceptable. Stood alongside our laser cutting machine are 2 Trumpf CNC punch presses which can process a wide range of sheet metal materials and thicknesses. 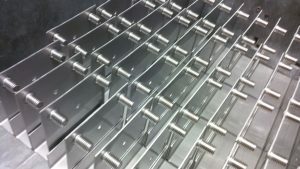 Often when we are laser cutting aluminium sheet metal work we may then use one of our CNC punch presses to finish off a component. Perhaps it will need ventilation louvres, formed dimples or self tapping screw forms all of which can easily be pressed in after laser cutting. Having both types of blank processing machines enables V and F Sheet Metal to provide the right manufacturing process to suit your sheet metal work design and volumes. 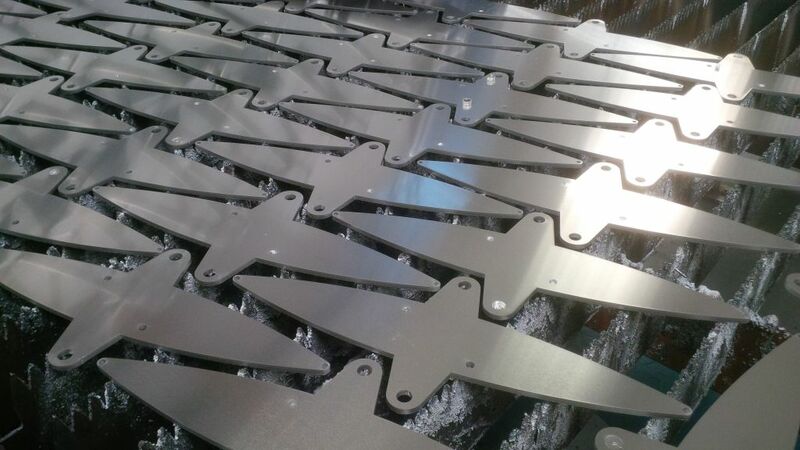 Laser cutting aluminium sheet metal work is just one of the metals that we often cut alongside mild steel and stainless alloys. Being a fibre laser we can also cut brass and copper without any fuss right up to 6mm thick. 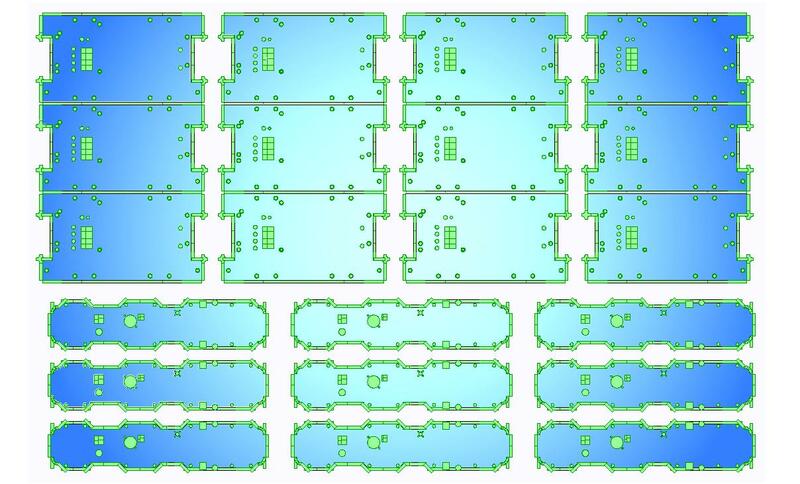 So if you are looking for a new supplier of laser cut sheet metal work please give us a call on 01489 577786 or send us your drawings to sales@vandf.co.uk and we will be happy to provide you with some price options. 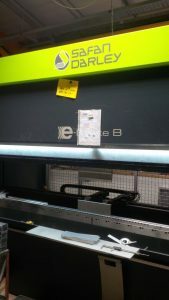 Looking to have your sheet metal work laser cut, please take a look below. 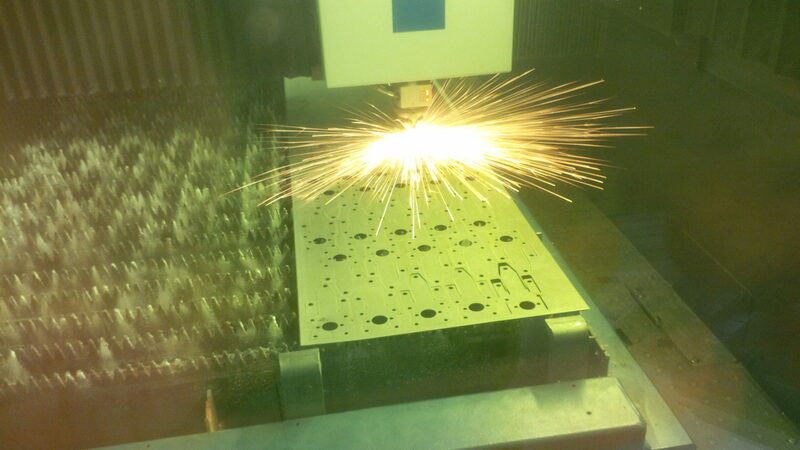 Here’s another great video showing how versatile our Trumpf 3030 3KW fibre laser can be when used to manufacture sub-contract sheet metal work. We are laser cutting 0.7mm thick zinc coated mild steel, called zintec, to produce gear trays for LED light fittings for one of our customers in the UK. 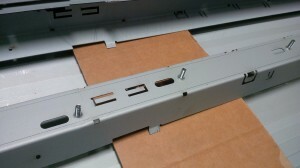 Laser cutting zintec is easy with our laser cutter and the finished parts are clean and grease free. With a laser cutter there is no specific tooling needed so all sorts of complex cut-outs can be created easily and CNC programmed using our Radan sheet metal software without extra cost to our customers. These zintec gear trays are being laser cut using compressed air as the assist gas for a clean cut competitively prices part. If you have a sheet metal work project that needs laser cutting from zintec or other sheet metal materials please contact us and we will be happy to take a look at your design and produce prices for you. We will also see if your design can be altered to suit the best manufacturing techniques to save us time and save you money. 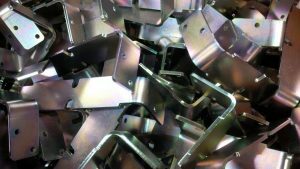 Here at V and F Sheet Metal we are folding up a wide range of sheet metal components on a daily basis. They can be small electronics screening cans in 0.3mm tin plated mild steel, 0.4mm special pre-anodised reflector aluminium alloys, 0.9mm zintec coated mild steel channels, 1.5mm pre-galvanised mild steel lighting gear trays, 2mm brushed stainless steel housings, 3mm copper bus bars, 4mm mild steel support angles, 19” rack aluminium components and so much more. The sheet metal work that we fold up may have just a single simple angle bend right through to multiple bent complex parts with easy bends, safe edges and multi bent curved sections. When folding sheet metal boxes we can employ a number of different machines and tooling techniques to make the right part for you. Today we are going to look at a component that has electrical cut-outs cut in a 3mm thick aluminium part which will cause a problem is they are folded up with normal air bending V tooling. The problem with using standard V bend tooling with cut-outs that are too near the bend line is the unsupported material that will be in the die bend zone will not fully bend up. This problem is increased with the increase in the sheet metal component thickness. Once way around this would be to bend up the components first and then machine in the cut-outs after which is acceptable but slow and would lead to an expensive part. The tooling technique we use to solve this problem is to use a range of RollBend tooling from Trumpf. This tooling can be used in both our Trumpf 7036 and Safan e-Brake CNC press brakes enabling us to cover a wide range of tricky bending work. The RollBend tooling rotates around 2 fixed points enabling the bottom tool to fully support the material as its being folded with no air gap. 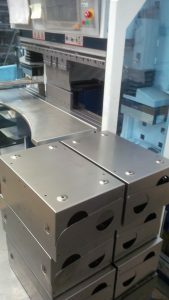 The machine can be set up with the standard top V tooling and can be run at the same speed as normal so importantly the part price is not affected by using this type of tooling. The set time is just as quick as using the normal bottom bend tooling and just drops straight into place in the bed of the machine. Here is the 3mm thick aluminium gear box folded up and ready to have a number of bushes and studs inserted before powder coating. You can see that the 2 circles and the 2 rectangular cut-outs have all the material between the cut-outs and the bend line bent up properly and require no other operations to straighten out the material. For more general information on CNC bending and CNC press brakes please follow the link. We are really pleased to be able to launch our new look website. Designed to be more flexible when viewed on the go now you can access tooling data, machine videos, the latest news etc. in the office, at home or where ever you need it. We will be adding more examples of sheet metal projects to our gallery pages soon and expanding on the design data pages. So if you are looking for more information on the full range of sheet metal services we can offer you here in Hampshire, UK or are interested in looking back at our past sheet metal projects for design ideas to help you with your latest sheet metal project, please take a look at our new website. 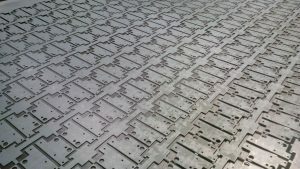 If you are looking for a sheet metal working company to CNC punch out your sheet metal components then V and F Sheet Metal based in Fareham, Hampshire, UK are just what you need. 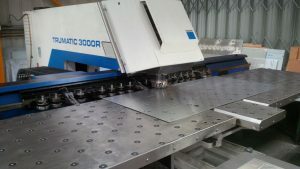 As well as a Trumpf 3030 3KW fibre laser machine we have Trumpf 200 and Trumpf 3000 CNC punch presses. These punch presses are very flexible machines being able to punch out components from 0.3mm to 5mm thick material in a wide range of metal materials. From 0.3mm tin plated steel and 0.4mm thick specialised aluminium lighting reflector materials, standard aluminium, mild steel, stainless steel alloys through to 5 bar tread plate, pre-painted steel and pre-anodised aluminium. All stainless steel and aluminium alloys can be supplied with plastic coatings on their top and bottom faces to prevent damage in production and during your assembly stages. 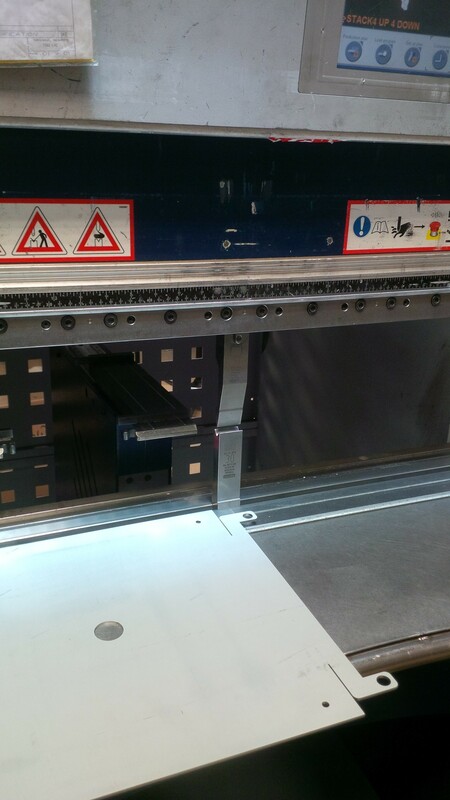 The machine shown here is our Trumpf 3000 CNC punch press punching out pre-painted mild steel sheet metal. The circular discs are gear trays for industrial light fittings and are very competitively priced compared to manufacturing from mild steel and powder coating white. 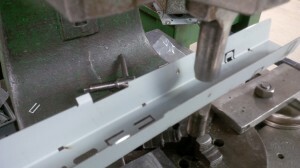 The final punch on this part would be to sever the component from the parent material and collect it in a tray underneath the machine from a programmable chute in the machine bed. The Trumpf machines having a single head which can rotate through 360 degrees make them very flexible when it comes to complex sheet metal designs and small batch work. 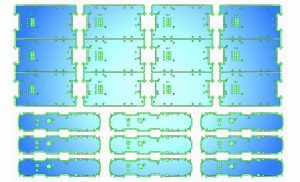 This flexibility can be advantageous when it comes to your designs with the ability to punch slots at any angle, cut-outs in complex shapes with our standard FREE CNC punch tooling. These CNC punch presses are fully supported in all manufacturing features by our Radan sheet metal CAD/CAM software as well as offering 3D modelling for accurate bank size calculations it allows us to swap jobs from our laser to our CNC punch presses when production work loads necessitate. Looking for a sheet metal worker with the flexibility and expertise to handle your production projects in a range of sheet metal materials, please give V and F Sheet Metal a call on 01489 577786 or e-mail your drawings to sales@vandf.co.uk and our engineering team will be happy to review them for you. 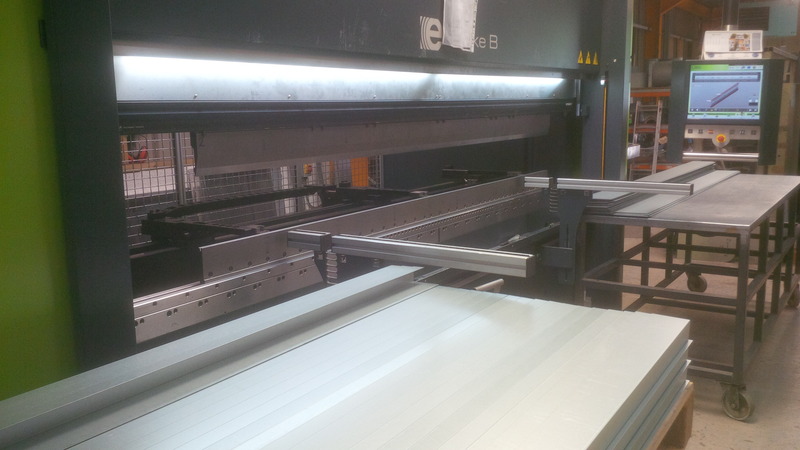 Our Safan e-Brake CNC press brake is such a versatile sheet metal folding machine. 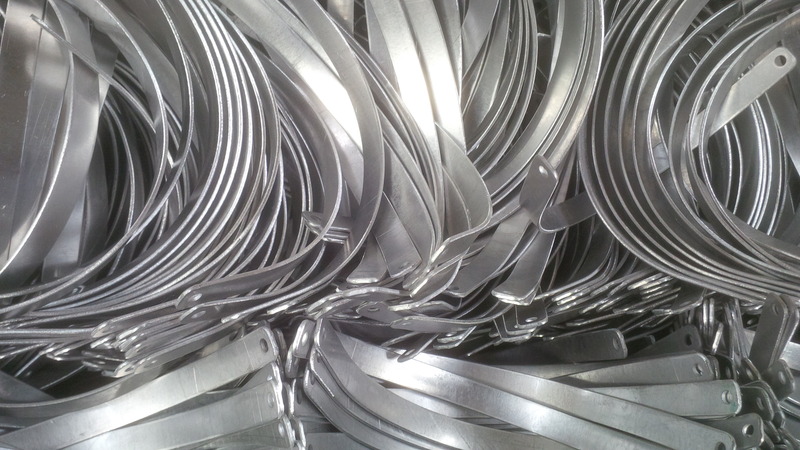 We can fold up sheet metal components from just a few mm across to 3M long sections all with the same bend tooling. Programming is so easy that a new project can be programmed in a matter of minutes and saved away to our system server to be called back whenever the part is needed for repeat orders. 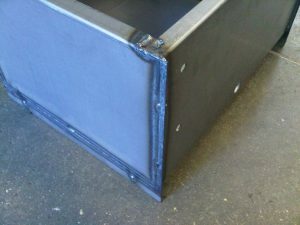 Simplicity is the key to a quick setup of a sheet metal component. When you are moving from one job to another throughout the day it’s not just about the speed of bending that saves time and money but the machine setup and programming time. The Safan e-Brake scores well on this account with a clear, simple touch screen control system and a full library of CNC tools shared with our 2 Trumpf 7036 CNC press brakes. 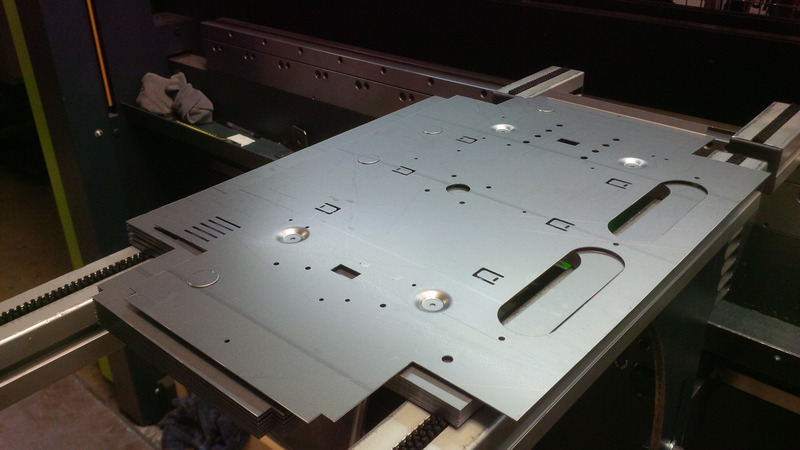 The initial product blanks were produced on our Trumpf 3000R CNC punch press from 0.9mm mild steel. 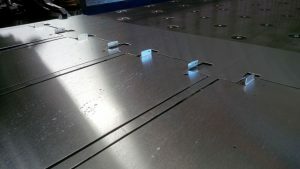 Products like this are typical of the sub-contract sheet metal work service we offer our customers, taking a design and programming it to be CNC punched or laser cut and folded up ready for welding, bush and stud insertion and powder coating. 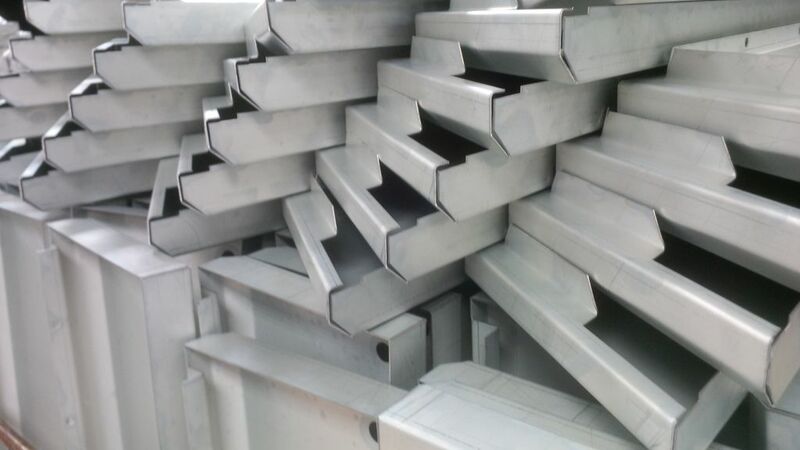 If you need to purchase some sheet metal housings or brackets please give us a call on 01489 577786 or e-mails us your drawings or photos to sales@vandf.co.uk and we will be happy to help you. Looking for sheet metal workers in the Winchester area? V and F Sheet Metal have been manufacturing sheet metal work and welded fabrications for over 30 years now. We supply a wide range of sheet metal products from our base here in Fareham, Hampshire to companies in Hampshire and right across the UK to the lighting, heating, electronics and professional audio industries as well as a wide range of specialist companies across the UK. We often deliver products to Winchester, Eastleigh, Southampton, Portsmouth and Basingstoke as well as using overnight services to Scotland, Wales and the rest of the England. 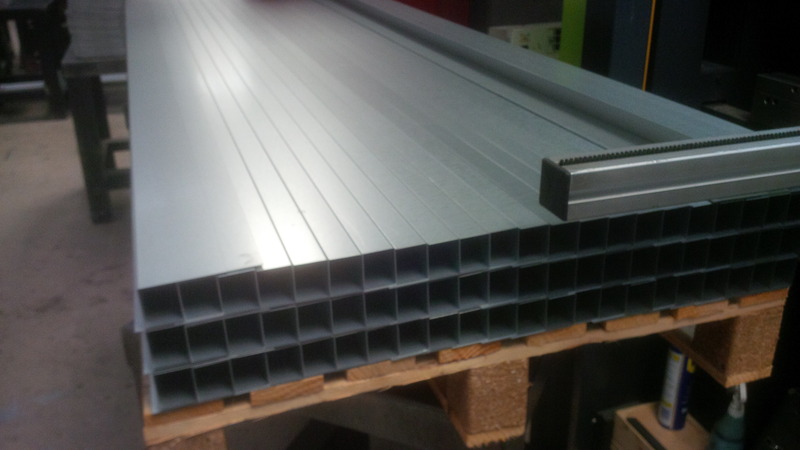 When you are making long channel sections like these you need a bending machine that can provide the bending power and accuracy on bend size and angle right up to 3M long. Our Safan e-Brake 100 ton CNC press brake is just such a machine. Installed new in 2015 this machine is perfectly suited to the range of sheet work we tend to bend and provides a bending force that matches the longest work we can laser cut. 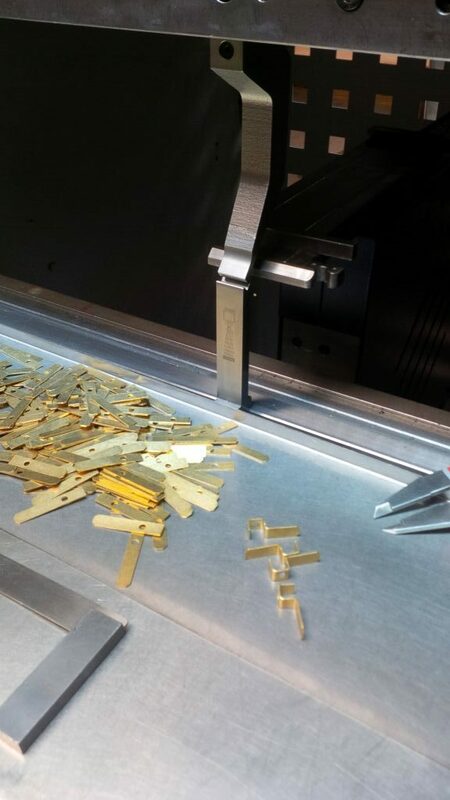 You can see here the guillotined blanks on the right hand of the bending machine and the finished folded U channels on the left hand side of the machine. 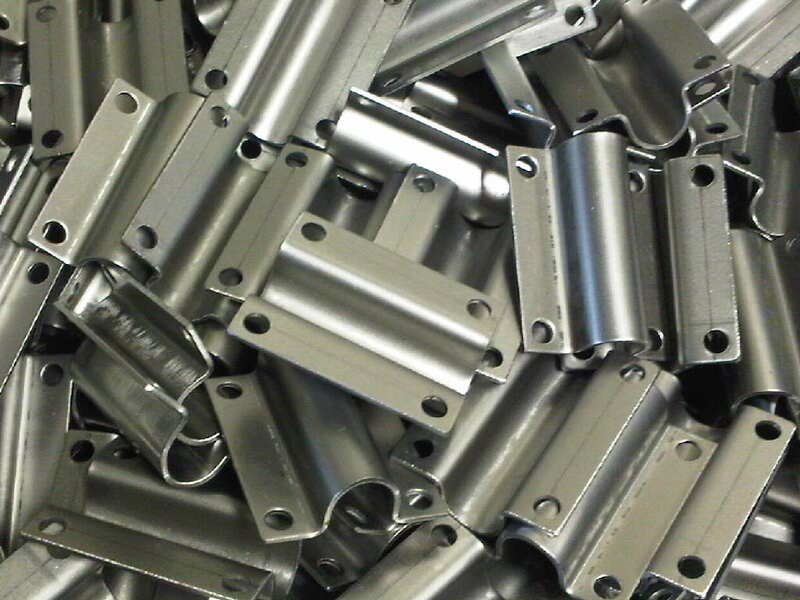 You need a fair bit of space when it comes to producing parts like these and our 13,000 sq. 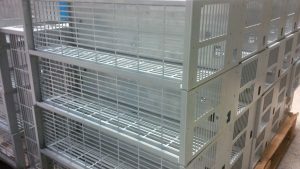 ft. factory provides the flexibility to take on this type of work as well as higher volumes of smaller parts. 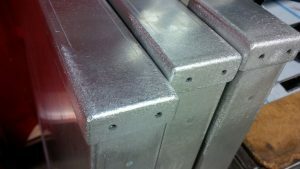 You only have to look through some of our past blog posts and the gallery pages on the website to see the wide range of sheet metal work that we get involved with for our customers. From these 3M long sections to CNC punched and folded aluminium lighting gear trays, stainless steel support brackets, mild steel electrical cabinets, copper bus bars, brass display units, aluminium LED display PCB plates etc. The final 3M long galvanised mild steel sections stacked on a pallet ready to be wrapped up and delivered to the customer. This batch was for 2 different channel cross sections and approximately 350 of each type. If you are based in Winchester or the surrounding areas of Hampshire and you want to visit us to discuss your sheet metal projects in more depth or you simply want to send us your drawings to sales@vandf.co.uk please don’t hesitate and we will be happy to help you. Looking for sheet metal work in the Gosport area? We are based in Fareham, Hampshire with a 13,000 Sq. 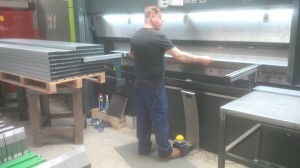 Ft. factory and we are well placed to manufacture sheet metal work for companies based in the Gosport area. 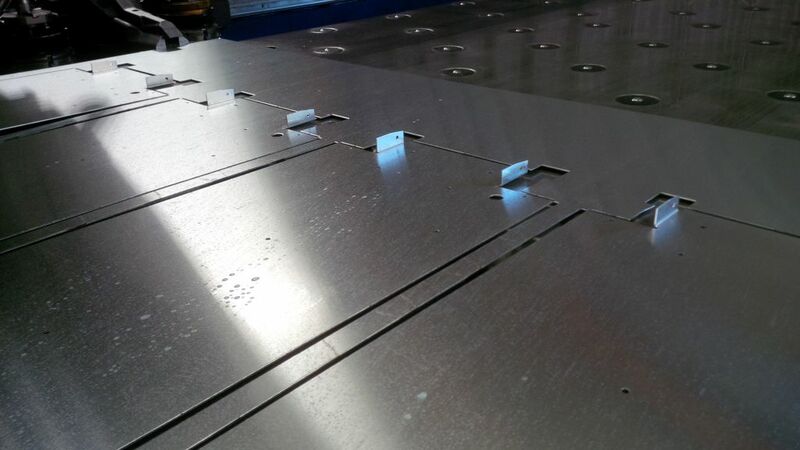 Whether it’s laser cutting, CNC punching or CNC bending sheet metal work, as illustrated here we are happy to help you with your designs refining them for efficient manufacturing and produce a range of price options for you. These sheet metal covers are relatively simple to produce (laser cut and CNC bent) and are typical of many products we manufacture for an array of customers large and small in Hampshire and further afield. We also produce more complex sheet metal fabrications using laser cutting, CNC punching, bending and welding techniques. 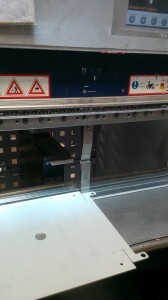 The machine shown here is a Trumpf 7036 CNC press brake. It’s one of 2 that we have which are 1M long and very quick. There are perfect for small batch production and prototype work but also equally at home folding up thousands of complex components. So if you are based in the Gosport area and you have a product that you manufacture and it needs some sheet metal work please give us a call. 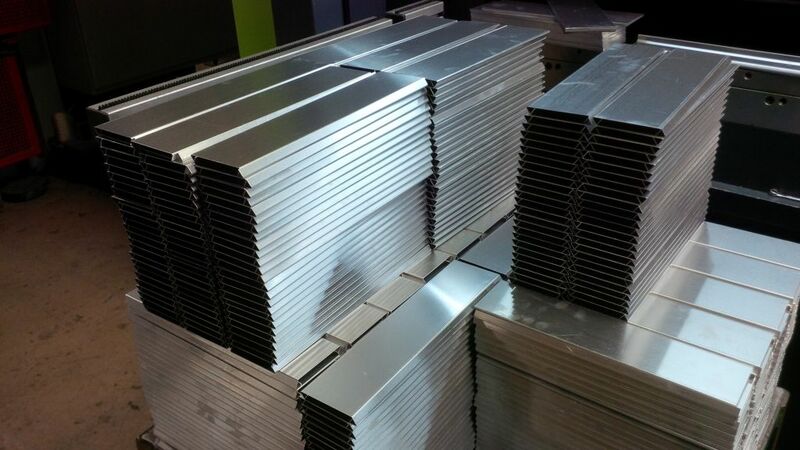 We also produce sheet metal work for companies right across the UK and are happy to have you call in and see us in action producing sheet metal products. A simple sheet metal plate made from mild steel sheet. 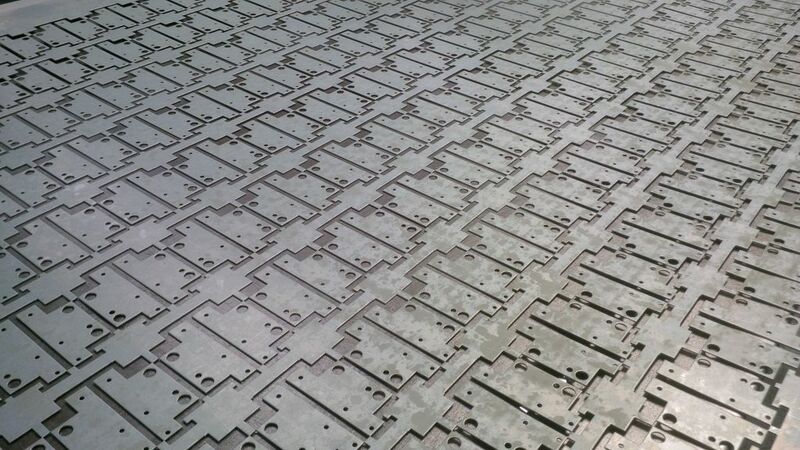 The parts have been CNC punched out on our Trumpf 3000 CNC punch press and they will be barrel de-burred to remove any sharpness from the CNC punching process before shipping to the customer. 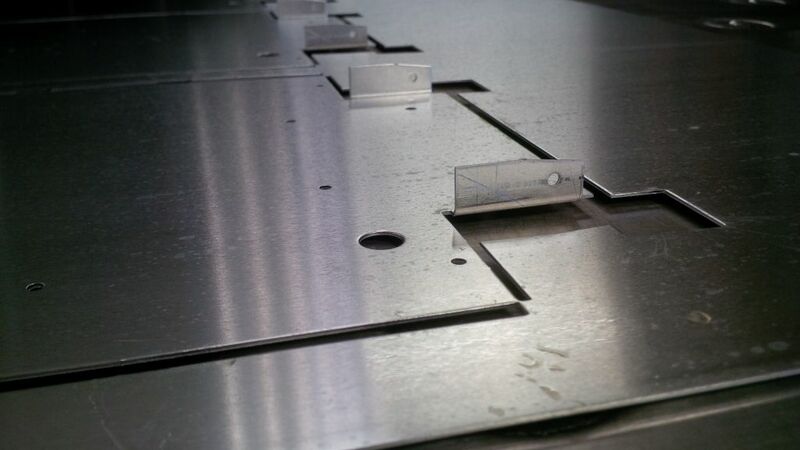 A simple sheet metal part, easily made in seconds on a CNC punch press and there’s not much else to say about this part except its typical of many simple parts we manufacture every day of the week here at V and F Sheet Metal. Have a simple sheet metal component that you need for your project, please give us a call on 01489 577786 or e-mail your drawings to sales@vandf.co.uk and we will be happy to help you. 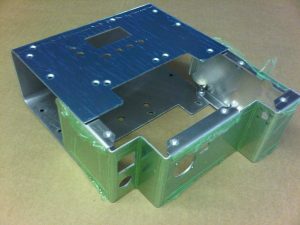 A range of sheet metal parts demonstrating CNC punching, CNC laser cutting and CNC bending in a sub-contract manufacturing environment. Virtually all the sheet metal projects that we manufacture for our customers use one or more of these production processes to produce the parts to our customer’s design. This is where most investment goes and the technology is supported by sophisticated software and control processes. 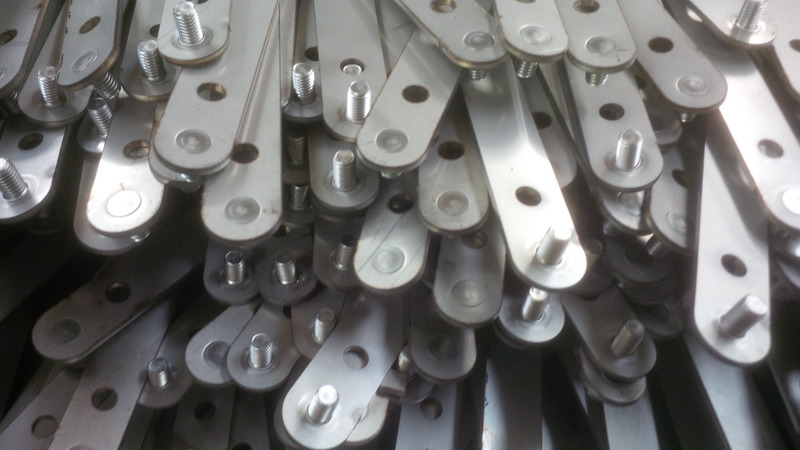 Some of these parts can be laser cut or CNC punched out from standard sheets of metal in seconds and with quick setting CNC press brakes can be bent in minutes. These techniques lead to competitive prices for small batches of parts when our customers cannot commit to higher volumes. To see the advantages of these production techniques in a modern manufacturing factory please contact us with your project. You can speak to our engineering team on 01489 577786 or send us your drawings in DXF, DWG, SAT, STEP or PDF format and we will be happy to help advise you on your designs and produce prices for you.